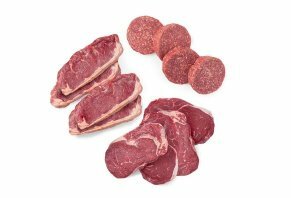 Pre Reviews: Is This Grass Fed Meat Delivery Worth It? Pre is a 100% pasture-raised beef company that offers subscription and one-time purchase options for sourcing Australian and New Zealand meat. Pre Review: Is It Worth It? Pre is a subscription beef delivery service that promises to ship you 100% grass-fed cuts of meat that were raised without added antibiotics, hormones, BPA or GMO’s. The brand states that they rely on a “15-point taste standard” to ensure every cut of beef is top-quality before a customer receives it. The company website states that Pre began as a way to better provide beef lovers what they were looking for: convenient, quality steaks. Pre exclusively sources their meat from Australia and New Zealand to take advantage of the nutrient-rich grasses that grow there, and the centuries-old farming culture of sustainable, ethical livestock treatment. Each cut of Pre meat is shipped in transparent, vacuum-sealed packaging so you can inspect the quality before opening each package, and the beef is paleo, keto, and Whole30 approved. Pre offers options for both one-time and subscription purchases. Customers can choose what they want and order without future commitment, or save 5% off every order by subscribing to receive monthly or quarterly orders. You can start the Pre ordering process by determining whether you want your meat to arrive fresh or frozen. The company website tells us that they sell their products through several platforms and it’s sold chilled in physical stores and through AmazonFresh, and frozen from their website and Amazon. Next, you can select your preferred meat by choosing one of the company’s curated beef boxes or filling your own from their collection of cuts. You can choose whether to receive a one-time order or to subscribe and save 5% off the total price on every monthly or quarterly delivery. Regardless of whether your meat arrives fresh or frozen, the brand states that it’s best to consume it before the “Use By” date on the label. The company recommends against thawing and refreezing the meat, as you’ll decrease its ability to retain moisture. Where Does Pre Beef Come From? At the time of writing, the Pre website states that they source their beef from select regions of Australia and New Zealand because of their ideal environmental conditions for year-round grazing. In the interest of being environmentally friendly, they receive all their beef in subprimal form by ship, which creates a smaller carbon footprint than air, rail or motor vehicle transportation. There’s a lot of confusion today about the meaning of different food label terms. What’s the real difference between beef that’s labeled grass-fed or grass-finished? Pre tells us that the terms “grass-fed and finished” and “100% grass-fed" refer to cattle that were raised exclusively on pastured grass after weaning without any access to grain. “Grass-fed” beef, in contrast, refers to cattle that are fed grasses until the finishing period, at which point they may or may not have been finished on grain to add extra fat in the final weeks. So what’s the difference for consumers? Pre tells us that the flavor of grain-fed meat primarily comes from the fat content, while grass-fed beef tends to have a leaner taste and a more nuanced flavor profile. Healthline corroborates these claims, noting that grass-fed beef tends to have less monounsaturated fat and five times more omega-3 fatty acids than otherwise equivalent grain-fed cuts. Likewise, grass-fed beef tends to have more far more vitamin A and E per serving, making it a more nutritious form of meat overall. At the time of writing, Pre does not source organic meat. The company website states that though they appreciate the mindset behind certified organic beef, the quality and consistency is often lower than other varieties. Likewise, a lot of organic cattle are raised on corn diets, which increases the meat’s fat and calorie content compared to grass-fed cuts. For these reasons, Pre focuses instead on sourcing pasture-raised meat for a consistent, delicious beef product that is lower in fat and calories than many organic varieties. Despite this lack of organic certification, the company makes it clear they are committed to environmental sustainability and animal welfare. Their website states that all their meat is raised without unnecessary antibiotics, though veterinarians will still administer them as necessary when an animal is sick. They also prioritize keeping each animal free from hunger, thirst, injury, and general discomfort to maintain a high quality of life for them. What Does Pre Grass Fed Beef Cost? At the time of writing, the company delivered throughout the 48 contiguous states, and all orders are shipped in 100% recyclable containers. The company states that it’s possible to request refunds for any reason by contacting the company at 844-PRE-FOOD (773-3663) or reachus@eatpre.com. If your refund request is approved, the company will credit your original payment method within a week. What Do Previous Customers Think of Pre? Do customers appreciate Pre’s beef? We looked at reviews on the company’s Facebook page to find out. After almost fifty reviews, Pre averaged 4.9 stars out of five, proving that the brand was keeping their customers happy. Reading through these comments, it’s clear that customers are impressed with Pre beef. Many wrote that the packaging for shipments was top quality and that their meat was still frozen solid when they received it. Others commented that the steak tasted better than the best cuts available at the local steakhouse and that Pre’s customer service was easy to work with and committed to making the ordering process seamless. Many reviewers also noted that Pre was their first exposure to grass-fed beef and that they found the flavor more satisfying than with standard steaks. In fact, we weren’t able to track down any negative comments about the company. Amazon also showcased reviews about Pre beef. Each cut was ranked separately, and they averaged between 3.5 stars and 4.5 stars. We noticed similar glowing comments about the quality of the meat, though some reviewers also noted that they struggled to nail the cooking time for their steaks because the lower fat content caused them to cook faster than standard meat. A small percentage of reviewers also made negative comments about the steak’s taste, stating that they thought it was bland or even gamey. Shipping Range Continental U.S. Across the U.S. Across the U.S. Looking at these three meat companies, it’s clear that there’s significant variation in their pricing, delivery process, and offerings. Pre is the only brand we looked at that sells their beef in stores, by subscription box, and as one-time orders. Butcher Box is only a subscription service and U.S. Wellness Meats operates as a traditional e-commerce store. Likewise, Pre only sells 100% grass-fed beef, while the other two brands offer pastured beef, chicken, pork, and even lamb, bison, and poultry. Those who prefer more variation in their dinners might prefer the more extensive selection offered from Butcher Box and U.S. Wellness Meats, while Pre might better serve those who don't want to pay for anything but grass-fed beef. Of these three brands, Pre’s price per sirloin steak is the highest. It’s also worth noting that this company received the highest percentage of positive customer reviews from the stats we looked at, which seems to show that customers are satisfied with the meat quality and are willing to pay slightly more to have it. Our View: Should You Consider Pre? If you’re looking to shift your diet towards eating more 100% pastured meat, there’s plenty of reason to consider sourcing your beef from Pre. This innovative company is striving to make it more convenient to purchase quality meat from Australia and New Zealand, and the brand states that they aim to deliver their products to customers in environmentally conscious ways. You’ll pay premium pricing for a Pre steak, but the brand’s previous customers don’t seem to mind, as the company Facebook page is filled with exemplary reviews. You also have the convenience of choosing between multiple buying options, including in-store, on a subscription basis, or as a one-time purchase. If you buy beef from Pre and aren’t happy with it, keep in mind that the company will honor your refund request if you contact them directly. Write a Review for Pre!